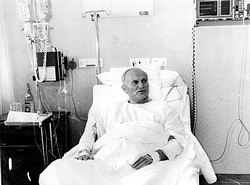 AS a medical patient, Pope John Paul II was co-operative, insisted on being fully informed, but very often put off treatment if there was a chance it would take him away from his pastoral commitments. In fact, according to his personal physician, Dr Renato Buzzonetti, even when Pope John Paul was having major breathing crises the month before he died and was told he needed a tracheotomy, he asked if it could wait. “The patient gave his consent, but not without having asked with moving simplicity if it would be possible to wait until the summer holidays,” the doctor said. Dr Buzzonetti’s account of Pope John Paul’s health problems and the Pope’s April 2, 2005 death is included in the Italian book, Let Me Go: The Strength in Weakness of John Paul II. The title of the book comes from the last words, murmured in Polish, by the pope, “Let me go to the house of the Father”. Released on March 15, the book also features reflections by the pope’s longtime secretary, Cardinal Stanislaw Dziwisz of Krakow, and by Archbishop Angelo Comastri, the papal vicar for Vatican City State. Dr Buzzonetti, who was Pope John Paul’s physician for almost 27 years, wrote that when the pope was not feeling well, he would describe his symptoms concisely “with the aim of simply enlightening his doctor and accelerating his treatment so he could get back to work”. “He always demonstrated an attitude of profound interior serenity which – despite some moments of visible human disappointment and impatience – led him to accept sickness, physical pain and forced inactivity from the hands of God,” the doctor said. Dr Buzzonetti’s contribution to the book opened with an account of the medical care Pope John Paul received immediately after being shot on May 13, 1981 in St Peter’s Square. The pope underwent emergency surgery, which lasted five hours and 35 minutes, the doctor said. Seventeen days after being released from the hospital, the pope, suffering from a high fever, had to return to Gemelli Hospital for treatment of an infection contracted from blood he received during the operation. Dr Buzzonetti, conveying a sense of surprise, said the pope sat in on a meeting of his doctors and specialists called in for consultation, including a discussion about when to operate to close the colostomy, or intestinal bypass, performed immediately after the shooting. “He was in great form and, while recognising he was not competent in medical questions, he affirmed the right of a patient – his right – to be the subject and not a passive object in managing the illness,” the doctor wrote. The pope asked the doctors not to delay the second operation “so as not to further postpone his many planned commitments, including ad limina visits” with bishops from around the world, Dr Buzzonetti wrote. The doctor’s brief account of his years as Pope John Paul’s personal physician is filled with references to the pope’s determining the timing of treatment based on his pastoral commitments. Dr Buzzonetti did not say when Pope John Paul told him about symptoms later determined to be related to a colon tumour, but, the doctor said, “the definitive tests could be performed only at the beginning of the month of July, according to a calendar fixed personally by the Holy Father”. The tumour, removed on July 15, 1992, was not malignant, although a biopsy showed that some cells were becoming cancerous, he said. Dr Buzzonetti also wrote that in 1993 when the pope tripped during an audience, dislocating his shoulder and fracturing the shoulder socket, he was convinced that the pope was experiencing a problem with his balance due to a neurological disorder, “the first signs of which were observed in the last months of 1991”. While the pope was alive, the Vatican never publicly confirmed that he had Parkinson’s disease. The doctor said the “pharmacological and rehabilitative therapy” prescribed for the pope, in consultation with experts from several countries, “did not give brilliant results”. When the pope slipped in 1994 and broke the top of his thighbone, Dr Buzzonetti said, “in order to convince the pope of its seriousness, in addition to a visit by an orthopedic specialist, in the middle of the night a radiographic exam (X-ray) was performed in his apartment. The pope was supposed to leave the next day for a pastoral visit to Sicily”. When the pope first began having trouble speaking and breathing in January 2005, Dr Buzzonetti said, his symptoms were not alarming and did not hint at “such a rapid deterioration weighted with such dangerous complications”. Hospitalised from February 1-10, the pope returned home and was assisted by members of the Vatican medical team 24 hours a day, the doctor said. The recurrence of spasms and swelling in his throat, which made it impossible for the pope to breathe, required further hospitalisation and the recommendation that the pope undergo a tracheotomy with the “permanent positioning” of a tube in his throat, the doctor said. Once the doctors convinced the pope it would not wait until summer, the operation was performed. “It was an expression of surprise and frustration over the new condition in which he brusquely found himself, but immediately purified by the act of entrusting himself to Mary,” the doctor said. The pope died in his bedroom at the Vatican after explicitly affirming he did not want to return to the hospital and expressing his desire to be with God, Dr Buzzonetti said. “John Paul II’s blessed hope was fulfilled,” he added.